The contours of geography and history have been abruptly truncated by political intervention in many parts of the world. I remember the West and East German divide as a prime example of what politics can do to the same people - barricade them inside their own perceived security zones and change them to the extent they become like aliens from outer space to one another. In a short span of time even language, food habits and the way people of the west and east dressed changed. There are, of course, many examples all over the world: North and South Korea and the erstwhile North and South Vietnam come to mind easily. Darjeeling is the famous Himalayan hill station created by the British to escape the unbearable heat of the Calcutta summer. Today Darjeeling is what we drink every morning thanks to the black tea the British planted there and which they imbued to the world. To me Darjeeling has always been a fascinating example of this political intervention in our own backyard. The Nepalese community there dress like us, speak the same language a little differently from us but, glaringly, they salute another flag and stand at attention to another national anthem. How did this come about? Regent Bahadur Shah pursued the unification drive of his father King Prithivi Narayan Shah taking the Gorkhali troops from a unified Kathmandu Valley to the eastern parts of Nepal. The ancient Kirati race ruling the roost in Kathmandu Valley at the dawn of our history had been uprooted a long time ago by the vagaries of fortune and, over many centuries, had lived in the eastern parts of Nepal in many fiefdoms, never quite re-grouping to form a large nation state. The Gorkhali armies swept across Nepal and the juggernaut reached the Bhutia kingdom of Sikkim which they conquered in 1790 A.D. The hill tribes of eastern Nepal were united under one flag for the first time in the modern era. But it was not to last long! The Gorkhali juggernaut was stopped by the more powerful forces of the British Raj and after a short war the Treaty of Sugauly was signed in 1816 A.D. under whose terms we forfeited the territories in the east from the River Mechi to the River Teesta, Darjeeling and Sikkim included. Maharajah Juddha Shumsher Jung Bahadur Rana was a pious man. He was grateful to the Gods for his good fortune which came in no small measure due to the compassion shown by his elder brothers in elevating him from obscurity to center stage. His mother Juhar Kumari Devi was the youngest wife of his father Commander-in-Chief Dhir Shumsher, the youngest brother of Maharajah Jung Bahadur Rana. She was of uncertain lineage. He was still a minor when his father Dhir Shumsher died. His eldest brother Bir Shumsher after gaining the prime-ministership enlisted him on the Roll of Succession to the Rana prime ministership. He was fostered by his sister-in-law Bada Maharani Karma Kumari the first wife of another brother Dev Shumsher. Juddha did not forget. He built a large statue of her in memoriam and placed it in the Jawalakhel Zoo he completed in 1932 A.D. This is the largest statue of a female in all of Nepal till today! He also built a statue of his mother Juhar Kumari and placed it in the same zoo overlooking the central pond. Dhir Dham Temple circa 1939 A.D. 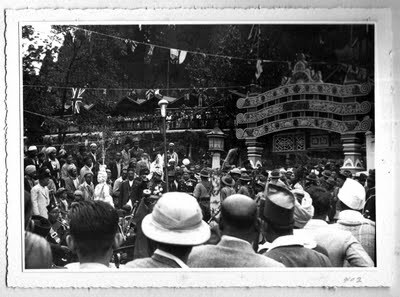 It was at this time Juddha decided to consecrate a Hindu temple for the Nepalese community of Darjeeling, a gift of devotion dedicated to his father Commander-in-Chief Dhir Shumsher Jung Bahadur Rana. Maharajah's Juddha's eldest son General Bahadur Shumsher was sent to inaugurate the temple as Dhir Dham, a sacred pilgrimage spot, in 1939 A.D. 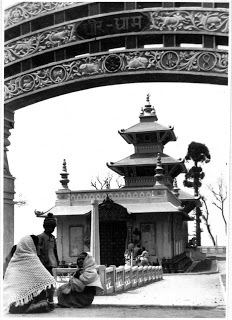 The Hindus of Darjeeling and the surrounding areas were glad to have a mirror image of faraway Pashupatinath of Kathmandu at a time when travel to Nepal was not easy. The temple similarly houses a Shiva Lingam depicting "Pancha Bakram Tri Netram" representing five different facial expressions of Lord Shiva in different moods and the third eye. 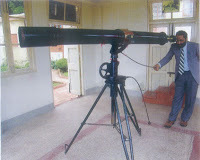 General Bahadur also gifted to Darjeeling the powerful Carl Zeiss Jena telescope presented by German Chancellor Adolf Hitler to Juddha before WWII. It is housed in the Himalayan Mountaineering Institute. The construction of the temple was carried out by Rai Saheb Purna Bahadur Pradhan. He was probably the contractor who got the job of actually building the temple. However, reading the travel guides of Darjeeling I find neither any mention of the benefactor nor the story behind it. I hope this blog helps shed light on the reason why Dhir Dham came into existence as an umbilical cord linking the lost territories of the eastern hills to the mother country. Wonderful to hear that there is a temple of Lord Pashupatinath in Darjeeling -- certainly an "umbilical cord" to the mother country as you put it so well. Darjeeling is currently fighting for statehood in the Indian confederation, and losing the battle by most accounts. Too bad the mother country is in no position to help. On the subject of the 1816 Treaty of Sugauli between Nepal and the British. Until then, Nepal's eastern boundary was till the Teesta river and its western boundary till the Sutlej river. "From Sutlej to Teesta" is the cry of Nepalis who still dream of a "Greater Nepal". No harm in dreaming. But the underlying question is that of legality. That treaty was between Nepal and the British. When India gained independence from the Brits in 1947, the latter ought to have had the presence of mind to return to Nepal what was Nepal's. The Sugauli Treaty was NOT between Nepal and India, after all. Case in point: the manner in which the Brits handed over Palestine to Israel. What's good for the gander sure wasn't good enough for the goose on this one! Had the restive Nepali populations in those areas made enough noise and created liberation fronts and had Kathmandu also made a case to Lord Mountbatten, perhaps those areas would be returned to Nepal. Unfortunately too the Nepali National Congress was more intent in fighting the Rana Regime than liberating those territories.